A total triumph in every way." - Paul Bolin, www.theaudiobeat.com, 5/5 Music, 4.5/5 Sound! Cut From the Original Analog Masters and Pressed on 200-gram Vinyl At Quality Record Pressings! Acoustic Dead! In the fall of 1980, the Grateful Dead purposefully played a series of shows at two venues (the Warfield Theater in San Francisco and Radio City Music Hall in New York City) that were considerably smaller than the stadiums and arenas the band, by that point, regularly sold-out. The group did so with the express interest of recording in an intimate space the opening portion of each show, a stripped-down acoustic set featuring Jerry Garcia and Bob Weir playing acoustic guitars,Brent Mydland playing piano, drummers Bill Kreutzmann and Mickey Hart helming reduced percussion kits, and bassist Phil Lesh turning his electric volume down considerably. The group mixed classic folk and country tunes along with bare-bones originals and collected some of the best of these performances on Reckoning, an obvious ode to the band's early 1960s origins of folk, bluegrass and country. These are the sounds from which this whole long, strange trip was born. Garcia, in particular, shines radiantly, via his warm voice and interwoven guitar lines. 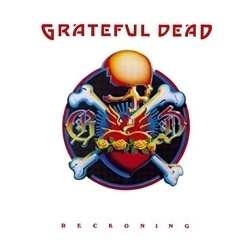 The production, as with many records focused on the bare essentials and on unplugged elements, portrays the group in close proximity to one another, each note and phrase blending together, each member's passages heard in a distinctive space.Reckoning should particularly appeal to music lovers that prefer a rootsy Dead that isn't give over to jamming. As such, the songs here are tight and compact, and yet dynamically delicate and eminently soulful. And they've never sounded better. Cut from the original analog masters and pressed at Quality Record Pressings, this edition of Reckoning lays waste to the original LP edition and blows away the digitally remastered CD, with plusher tones, wider and deeper soundstages, and more palpable acoustic body. Don't miss this acoustic gem! "Recommended without hesitation for both the musical craft and especially the recording that's nothing less than astonishing, as is the depth of the pressing blackness behind the music. There's no contest between the original pressing and this reissue cut by Kevin Gray from the original analog tapes and pressed at Quality Record Pressing." - Michael Fremer, analogplanet.com, Music 9/10, Sound 10/10! "Vividly three-dimensional images as big as life popped forth from a background of absolute silence. Acoustic-guitar transients were so natural that they were genuinely surprising. Details that passed unnoticed on the original emerged to fill out an entrancingly embroidered tapestry of music. The contextual space of the venues neatly overlaid themselves on my listening room -- and in order to be more like the real thing the Dead would have had to be in my listening room, and well behind the front wall in some cases." "Mastered by Kevin Gray from the original master tapes and pressed on massive 200-gram vinyl biscuits at Quality Record Pressings, this Reckoning features a foldout cover with full credits printed on thick, nearly archival-quality stock. The records themselves are absolutely flawless and dead quiet. It is my considered opinion that Quality Record Pressings is making the finest LPs that have ever been heard. I honestly cannot think of one thing about this release that could be improved. A total triumph in every way." - Paul Bolin, www.theaudiobeat.com, 5/5 Music, 4.5/5 Sound! Recorded Live At The Warfield Theater, San Francisco, September 25 - October 14, 1980, And At Radio City Music Hall, New York, October 22 - 31, 1980. Mixed at Club Front, San Rafael.